PCGamesN Says, "Shroud Of The Avatar Overwhelmingly Negative In STEAM" - KABALYERO - PLAY, BLOG & EARN! Home / early access game / indie game / mixed review / mmorpg / overwhelmingly negative / pcgamesn / sandbox mmo / shroud of the avatar / steam / PCGamesN Says, "Shroud Of The Avatar Overwhelmingly Negative In STEAM"
PCGamesN Says, "Shroud Of The Avatar Overwhelmingly Negative In STEAM"
According to PCGamesN and I quote, "Steam reviews for the Early Access version of Shroud of the Avatar being overwhelmingly negative". 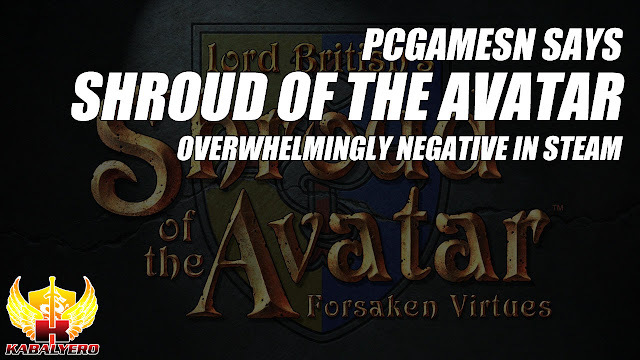 Yes, it's true that currently Shroud of the Avatar doesn't have an overall Positive rating in STEAM but it's far from Overwhelmingly Negative. 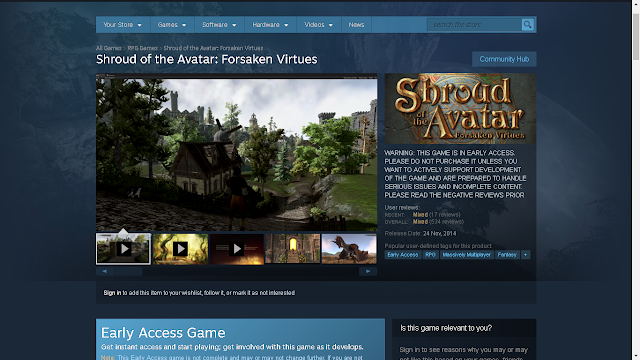 As of this moment, Shroud of the Avatar has an overall Mixed rating in STEAM and that means some people like Shroud of the Avatar and some people don't. For me that is expected because Shroud of the Avatar is a very different game with elements that divide fans like the Combat Deck System, Partial Loot PvP, Open World vs Instanced Scenes, Overland or Overworld Map and a lot more. But, to say that Shroud of the Avatar has an Overwhelmingly Negative rating is obviously an exaggerated bending of the truth. 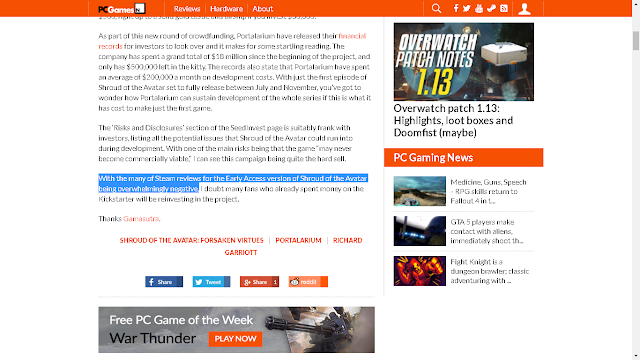 It seems to me that PCGamesN doesn't like Shroud of the Avatar very much and that is kinda SAD because PCGamesN is a fast growing online gaming magazine that can potentially influence how gamers look at games.